Sama ke chawal ki idli or sama ki idli is one of the most loved meals at my place, fasting or no fasting. 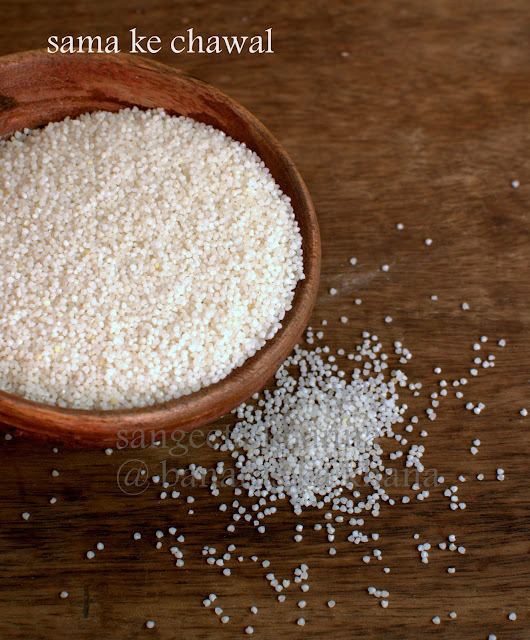 Navratri makes it easier as this grain (actually pseudo grain) starts appearing in the stores around this time, more than ever. Navaratri is a nine day (actually nine nights) period when Devi Durga is worshiped with utmost devotion. I am not sure if I have that devotion towards any God but I have been fasting all nine days of navaratri for 12 years barring the last three years when I could not manage doing the stuff. On the 8th day of navaratri we invite young girls and considering them the embodiment of devi (Goddess), we wash their feet, offer them prasad of halwa puri and kala chana which is a symbolic worship of devi, the female God (woman power to me). Another highlight of Navaratri is the food. The fasting food. It is more of feasting than fasting for the people who observe this fast as fried pakoras and pooris made with kootu ka atta (buckwheat flour) and singhare ka atta (water chestnut flour) and lots of potatoes fried in different ways becomes a staple for most of the people. Some people eat nothing during the day and eat these fried savories and ghee laden halwa of nuts for dinner. That is very unhealthy and one should try to consume some fruits, smoothies, lassi and juices during the day and some steamed or shallow fried preparation for dinner. Fasting is meant to detoxify, not to overburden the system.. I had some requests for healthy fasting recipes and I bought the sama ka chawal and some kuttu ka atta. Even though we are not fasting it was not a bad idea to have some sama ke chawal ki idli. Sama ka chawal is a wild grain and it has a mention in the history too (if the life and times of Krishna is history and not folklore). Sudama the childhood friend of Krishna was carrying this grain Sama in his potli (cloth pouch) when he arrived at the kingdom of Krishna, not sure in his heart if Krishna would recognize him. And when Krishna hugged him he snatched his potli of sama and enjoyed eating this humble grain as Sudama was treated with the finest delicacies of the palace. As I talked to my elders about this story of Sudama and Krishna, I am told it could have been Kodo (another millet, Paspalum scrobicilatum) or Sama (Barnyard millet or Echinochloa). 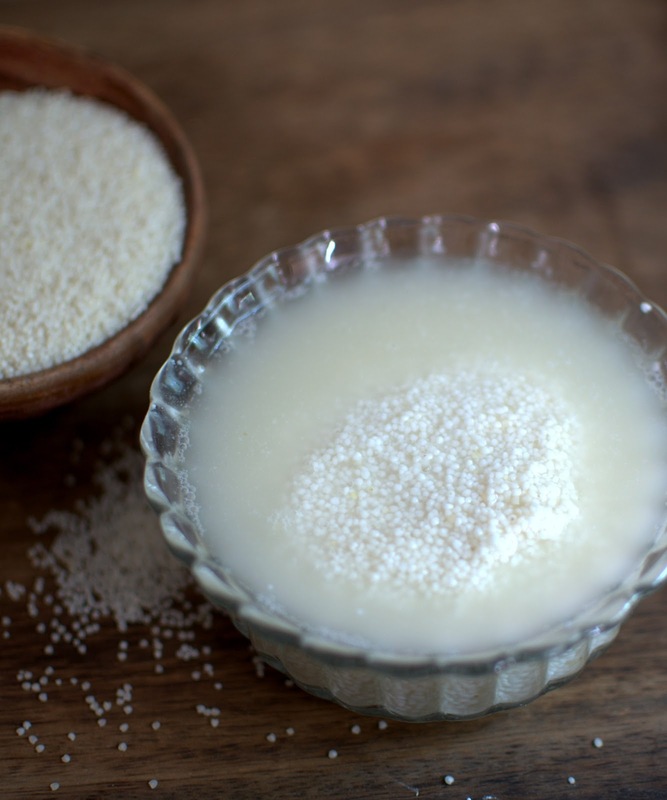 The procedure of making a steamed idli is very simple as many of us make rawa idi by soaking the rawa in curds for a while and steaming in the idli steamer. 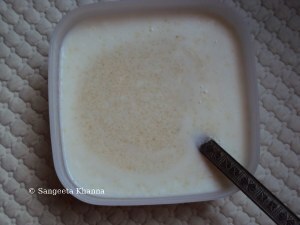 Soak the sama ke chawal in whey or buttermilk. Since I make this idly frequently, I took pictures with both. Now spoon in the batter into idli moulds (each portion including some of the soaking liquid too) and steam till a skewer comes out clean. I steamed it in microwave using greased ceramic soup bowls. It works out neat for me as I need just two large idlis to be steamed for the both of us. One 100 ml sized idli needed 1.30 minutes to be cooked. It should be cooked covered. 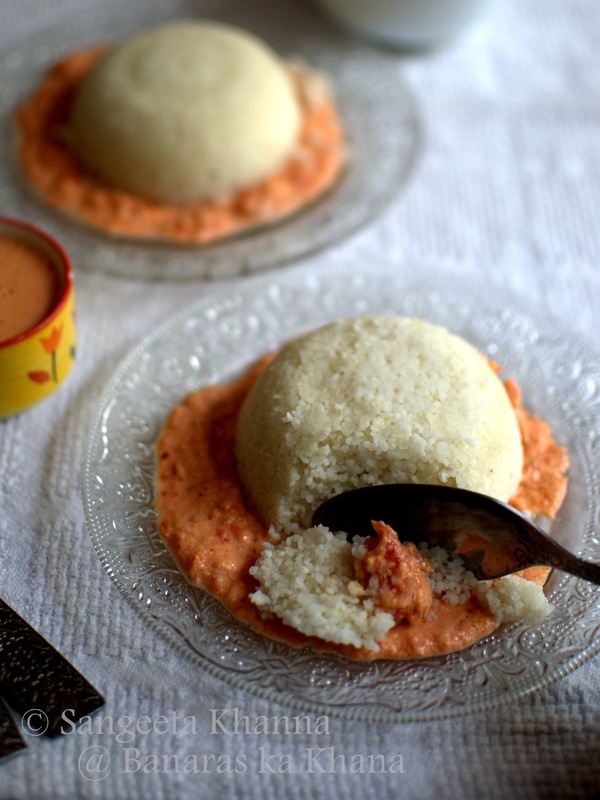 You need to run a spoon or a knife around the steamed idli to ease it out of the bowl. 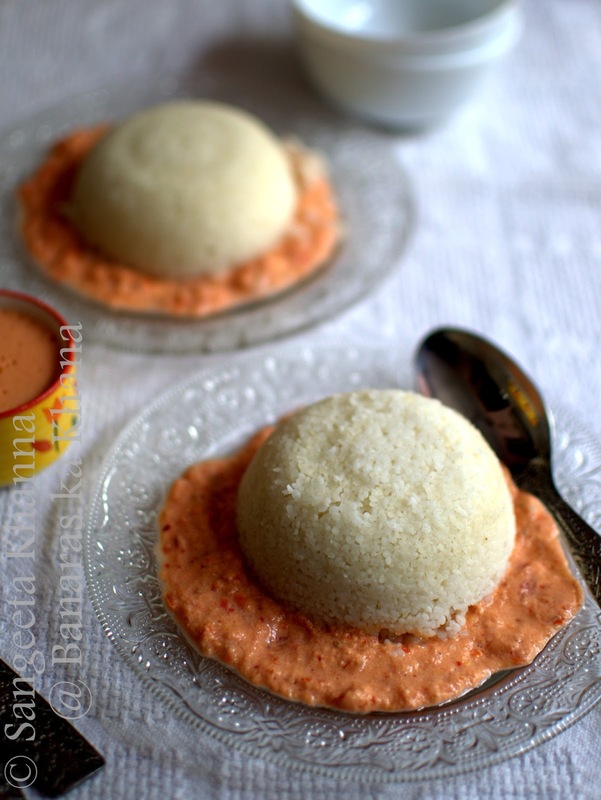 Check out how I steam rawa idli in glass or ceramic bowls..here.. Serve hot with any chutney of your choice. I made a chutney with 2 ripe tomatoes steamed in the microwave, 2 tbsp of broken cashew nuts, salt and red chilly powder to taste. 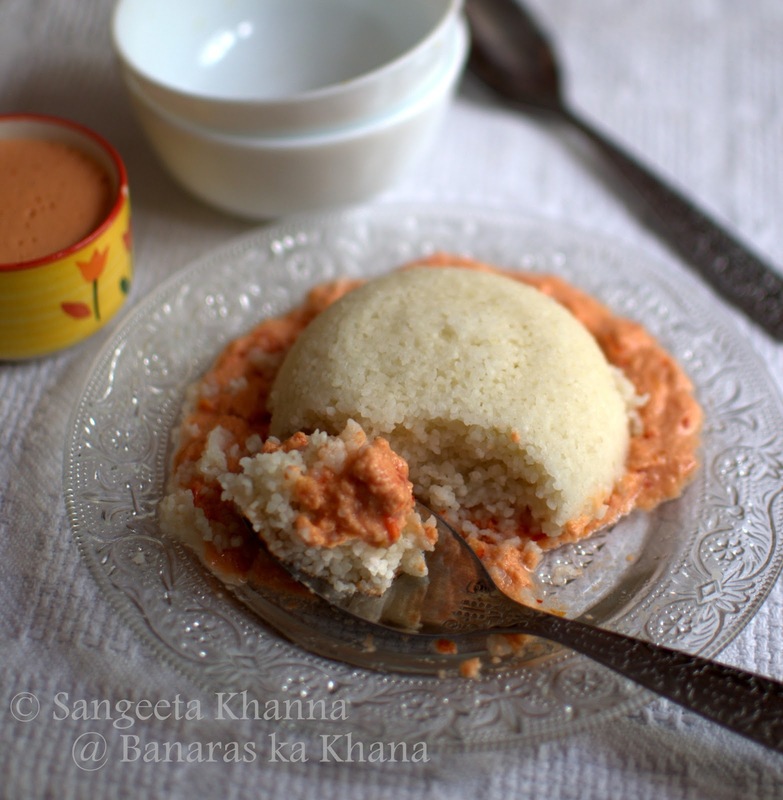 You'd notice that the texture of sama grains stands out in this idli and it's amazing. It has a wonderful soft bite. Larger grain size makes it a little crumbly and it soaks the chutney like a sponge. Interesting ingredient Never cooked with this before although I have seen it in shops. I too think that fasting is a kind of detox....this idli recipe sounds interesting, very soft and tasty with the chutney. wonderfull description of Navarathri..We have heard about it, but never knew of it. samak is barnyard millet. its botanical name is Echinochloa colona. Thanks Anonymous for the names . I like all types of wild millet grains and they should be marketed well in our country i feel. These are so good for the gluten intolerant people. i agree. these days people have forgotten that these are far nutritionally superior food and traditionally eaten in our culture. now wheat & rice are dominating our psyche. thanks for promoting sumptuous recepies of forgotten foods. hi, i have been looking for the botanical name of samwat ke chawal, found it here by anonymous. Glad for the idli recipe too. I haven't seen samak ka atta but it should work and shouldn't require prolonged soaking time too. Please do let me know if you try this idli with samak ka atta. Can I make idlis without eno or sabudana? Without eno idlis soft banegi??? There is no sabudana used n this recipe and not even eno. 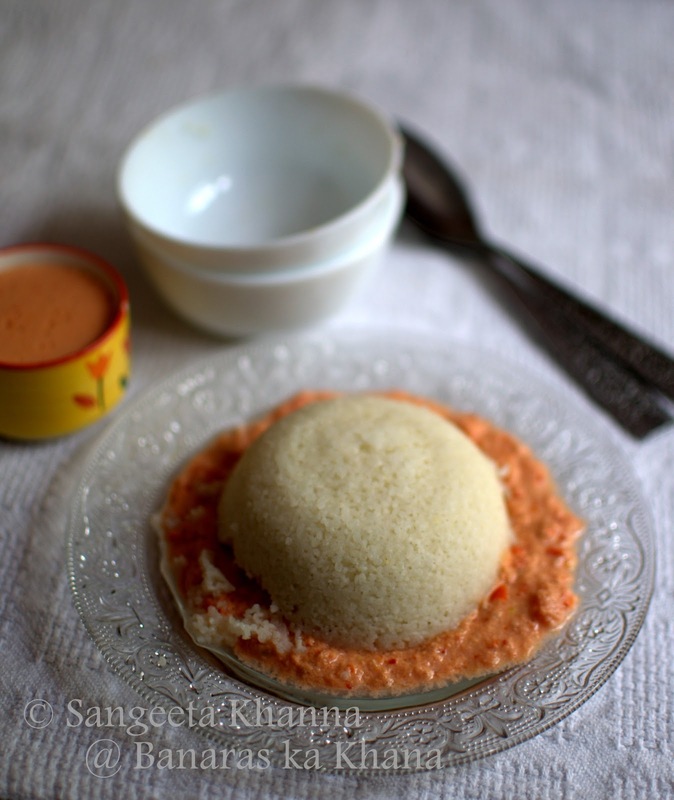 This is idli made with sama ke chawal or bhagar or Barnyard millet.